There are over 5000 frog species in the world. Each one has a unique call, and some frog calls can be heard a mile away!. Frogs don’t need to drink water as they absorb it through their skin. A frog’s call is unique to its species, and some frog calls can be heard up to a mile away. Some frogs can jump over 20 times their own body length; that is like a human jumping 30m. Due to their permeable skin, typically biphastic life (aquatic larvae and terrestrial adults), and mid-position in the food web frogs and other amphibians are excellent biological indicators of the wider health of ecosystems. Do frogs care for their offspring? Many species of frog care for their offspring. For example some poison dart frogs lay their eggs on the forest floor so they can guard them and urinate on them to keep them moist. Females of some frog species keep a regular check on their offspring (tadpoles) and if food becomes scarce she will deposit unfertilised eggs for them to eat. Asian tree frogs build nests in trees above water so that when the tadpoles hatch they fall directly into the water. 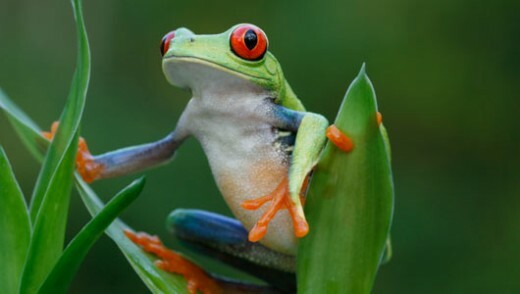 Habitat: Depending on the species, frogs can live in habitats as diverse as rain forests and deserts.